Crews are expected to be battling a fire on Main Street near Inkster Boulevard well into Sunday evening. 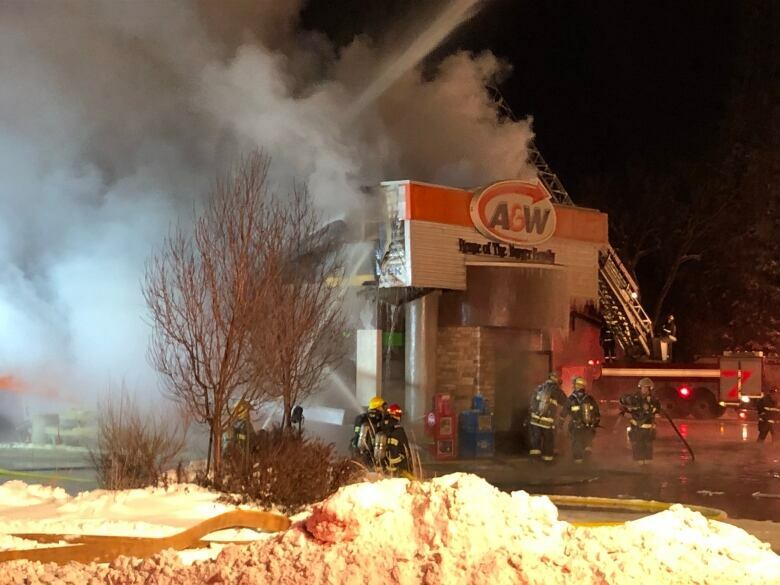 When fire-paramedic crews arrived at the A&W at 5:17 p.m. the building was fully engulfed, with flames shooting through the roof. Crews had to abandon an offensive attack because the fire was throwing off huge amounts of fire and heavy smoke. They retreated to a defensive strategy, which will mean battling the blaze into Sunday evening. Everyone in the restaurant had exited safely before crews arrived. No injuries have been reported. The cause and a damage estimate have not yet been determined. Crews were able to quickly put out a vehicle fire that broke out in the 600 block of Maryland Street around 5:20 p.m. It had spread to an adjacent garage, but no injuries have been reported. Winnipeg fire crews also fought off blazes on Hamilton Meadows Drive in west Winnipeg and at a Portage Avenue gym on Sunday.